It's considered by many to be one of the most beautiful flowering vines in the world! 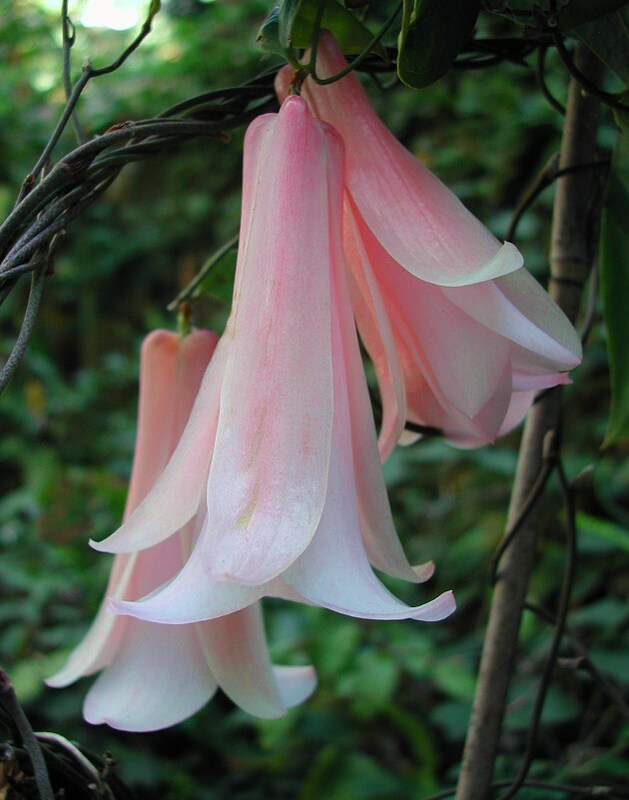 The Chilean Bellflower - Lapageria rosea - was rightfully chosen as the national flower of Chile. The sumptuous flowers of this cool-climate vine are treasured by gardeners for their beauty. The lovely Pink Blush form shown here is very rare. Freshly picked seeds are almost never seen for sale. The 3 inch long blooms of the Chilean Bellflower appear in large numbers throughout much of the year. The flowers may look delicate, but they're surprisingly thick and durable, and often last for weeks on the vine. The glossy, heart-shaped leaves are also thick and sturdy. This vigorous vine gracefully climbs its way up a trellis or fence, and looks absolutely stunning over an arbor! This pink form has darker shoulders that fade to a softer pink or white at the flared bottom. Cooler temperatures during flower development deepen the colors. The seedlings from this form will be somewhat variable, with different shades of pink, and possibly some nice streaks of dark pink down the petals. While the seedling color may be a bit unpredictable, there is no such thing as an ugly Lapageria! 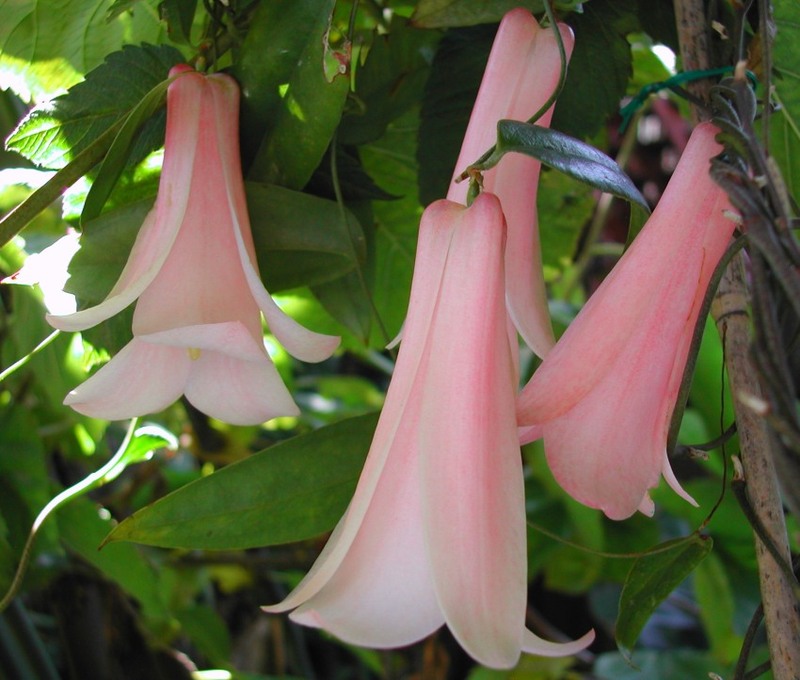 Lapageria comes from the cool mountains of Chile, and grows best between 40 and 80 degrees F (5-27°C), with cooler nights. It might not thrive if temperatures consistently get above 85 degrees (30°C), particularly if nights are warm. 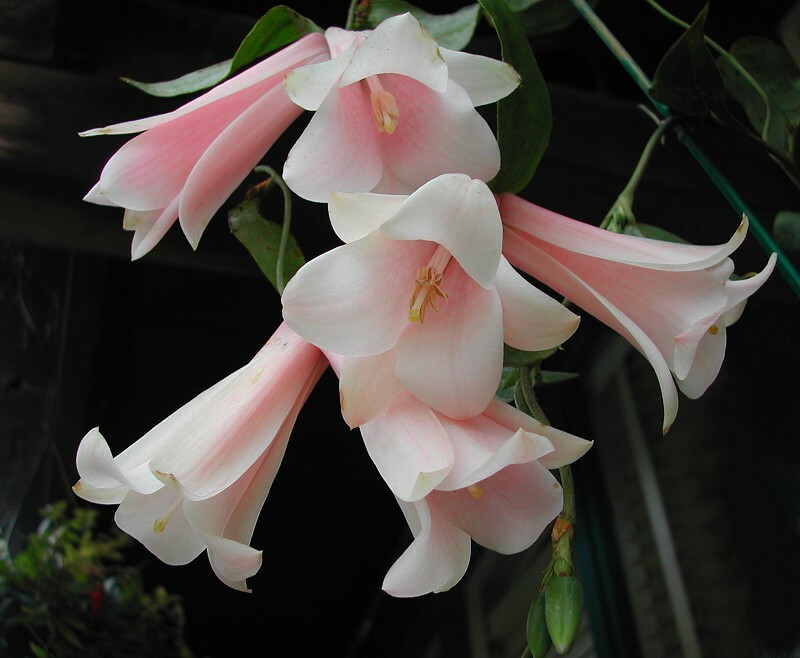 If you can grow Fuchsia or Clivia, you should be able to grow Lapageria. Try to protect it from freezing temperatures, although it is said to tolerate down to the low 20s (-5°C) if given overhead protection. It may be grown indoors, if the air isn't too dry (over 40% humidity is recommended). Give it something to twine itself around, like a trellis or wires. Since it comes from the forests, it prefers tree-filtered sun. Shade it from strong afternoon sun. It prefers moist, slightly acidic soil that's well-draining and low in lime. If your tap water is very high in minerals, it's best to use rainwater or bottled water. If you can provide the right conditions, it is an easy and long-lived vine. Stored seeds don't germinate well, so i offer freshly picked seeds and established plants. Beware of fake seeds from China.